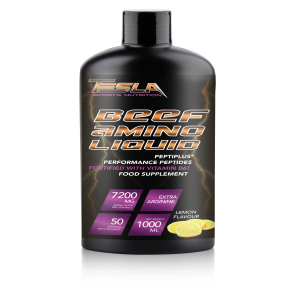 FOOD SUPPLEMENT LIQUID WITH COLLAGEN HYDROLYSATE, GLICYNE, VITAMIN B6 WITH SUGAR AND SWEETENER. Vitamin B6 contributes to normal protein and glycogen metabolism, to the reduction of tiredness and fatigue, and to the regulation of hormonal activity*. Shake well before use. Take 1 serving = 20 ml (see measuring cup) per day pure or mixed with water directly after your training. Do not drink Beef Amino Liquid directly from the bottle.